Is it hot out and you want to cool down with refreshingly chilly thoughts of snow capped cars and icy driveways? Click here to play! 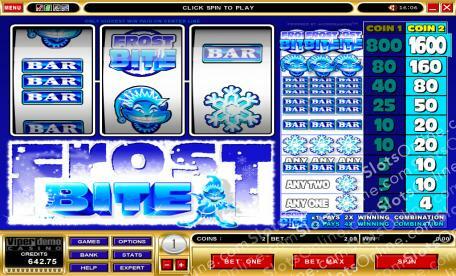 Then you need to play the Frost Bite slots, which feature freezing BAR symbols, an ice goblin, and beautiful snowflakes - not to mention the fantastic jackpot prize. In the Frost Bite slots, you must help Petey the Ice Goblin to collect enough snowballs to build his family a home. You can help Petey by playing for big cash prizes and getting combinations of snowflakes, Petey symbols, or the Frost Bite Logo symbols if you are looking to build Petey a snow mansion! Play the Frost Bite slots in the comfort of your home, where you can keep toasty warm in the winter, or cool down in the heat of summer, all while playing for a generous prize. Frost Bite Logo symbols are wild in this slots game, and they substitute for any other symbol. When 1 acts as a substitute, the prize is doubled. If 2 substitutes are used, though, the prize is quadrupled!